Adding 768 candidates in the Dutch elections, Open State Foundation launched a new version of Politwoops. Politicians sometimes regret what they tweeted. With Politwoops now running in 54 countries, one can search and find tweets that politicians have deleted. Besides automated archiving of deleted tweets by politicians, the new version of Politwoops has improved search and filter options and shows realtime statistics. It's now easier to see how fast a tweet has been deleted by a politician or a candidate for the elections, what and when politicians and what parties delete the most. Politicians sometimes regret what they tweeted. With Politwoops, now running in 54 countries, one can search and find tweets that politicians have deleted. Adding 768 candidates in the Dutch elections, Open State Foundation launched a new version of Politwoops. Besides automated archiving of deleted tweets by politicians, the new version of Politwoops has improved search and filter options and shows realtime statistics. It's now easier to see how fast a tweet has been deleted by a politician or a candidate for the elections, what and when politicians and what parties delete the most. 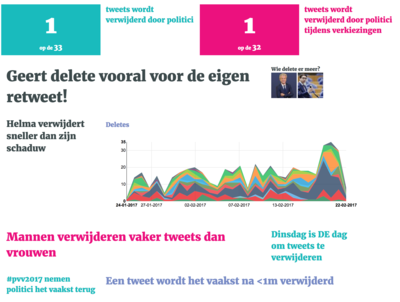 The past month, Mohammed Chahim of the Dutch Labourparty deleted 169 tweets. He deleted most tweets on one single day, 30 January, at the beginning of the election campaign. Candidates of Forum for Democracy, Arjan de Kok, Sassen van Elsloo and Gert Reedijk deleted tweets that included a fake poll. Arjan Kok of Forum for Democracy, PVV leader Geert Wilders and PVV candidate Maikel Boon and 50PLUS-candidate André van Wanrooij also delete a lot of tweets. Geert Wilders deletes mostly retweets of his own tweets in order to retweet them again. For example, his new campaign add.